Take advantage of HUGE savings, PLUS special discounts for active and retired military personnel. Purchase a vehicle during our Military Appreciation Sale and you'll be helping us to donate $21,000 to our local San Diego USO. 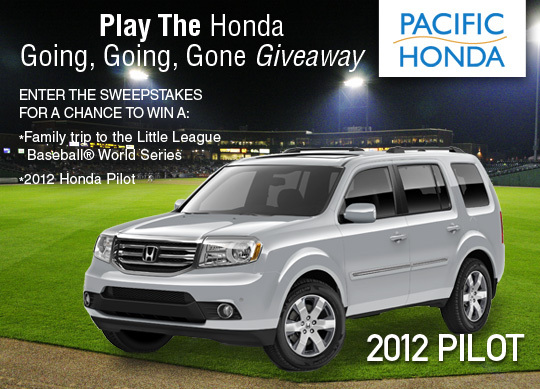 Stop by Pacific Honda today! 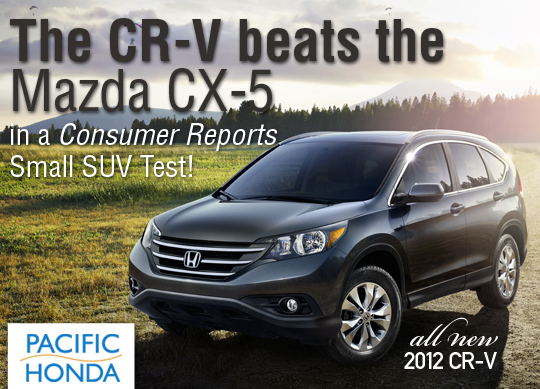 The 2012 Honda CR-V has topped the Mazda CX-5 in a recent Consumer Reports test of small SUVs. "Consumer Reports found that the CR-V EX is a more family-friendly SUV, with a large backseat, easy access, lots of cargo space, and a comfortable ride. It is also notably quicker and more responsive than the CX-5, with a refined drivetrain. Overall, CR's testers found the CR-V is functional and easy to live with." To read more and see the Consumer Reports review videos, visit Autoblog. Stop by Pacific Honda today to test drive the 2012 CR-V! USAA, a leading financial services provider to the U.S. military and their families, today named the 2012 Honda CR-Z Sport Hybrid Coupe to its second annual Best Value vehicles list, which identifies the top 2012 automobiles in 16 categories that give consumers the most bang for their buck. In addition, today USAA named the CR-Z to its "Top 10 for Teens List," which focuses on traits parents said they cared about most: reliability, safety and affordable insurance costs. 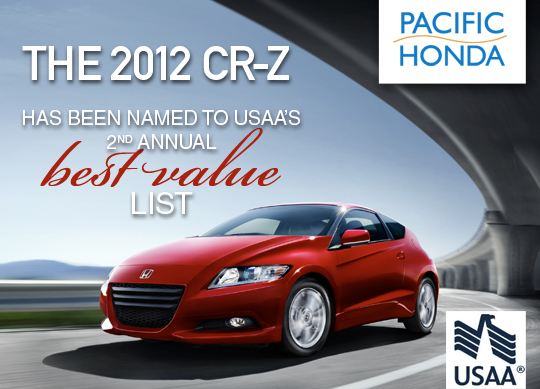 Head down to Pacific Honda to test drive the 2012 CR-Z today! This week at Pacific Honda we are celebrating mothers! Hope you all have a safe and happy Mother's Day Weekend. Drop by Pacific Honda to find that perfect gift! 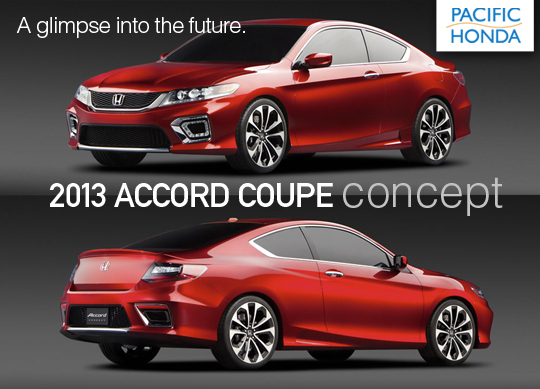 Would a sleek Accord Coupe be a nice change of pace from the daily routine in your Odyssey? The all-new 2013 Accord Coupe Concept was introduced at the North American International Auto Show in Detroit, giving us a taste of what to expect from the ninth-generation Accord. Read MORE about what we can expect from this dynamic vehicle. Stay tuned to see when the 2013 Accord will launch. Visit Pacific Honda to test drive any of the Honda vehicles today! Military Appreciation Month to Benefit SD USO! San Diego, Calif. – April 23, 2012 – Sunroad Automotive is celebrating its 35 years of being a part of the community by honoring its heroes. In support of the families of current and former military personnel, Sunroad Automotive is donating to the local military USO from the proceeds of its month-long Military Appreciation Sale. 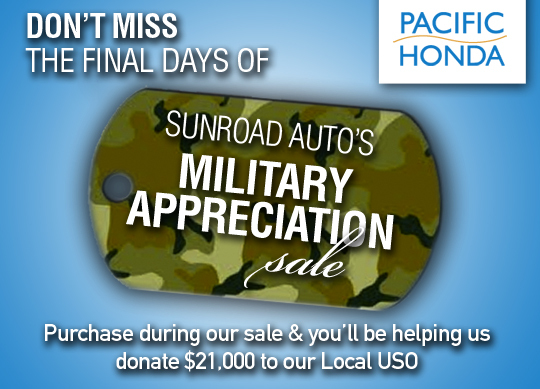 Automotive customers who purchase a vehicle during the month of May will be helping Sunroad Automotive donate a pledged $21,000 to the local USO. In addition to the donation, the San Diego-based company will be offering huge savings and special discounts to active and retired military members. 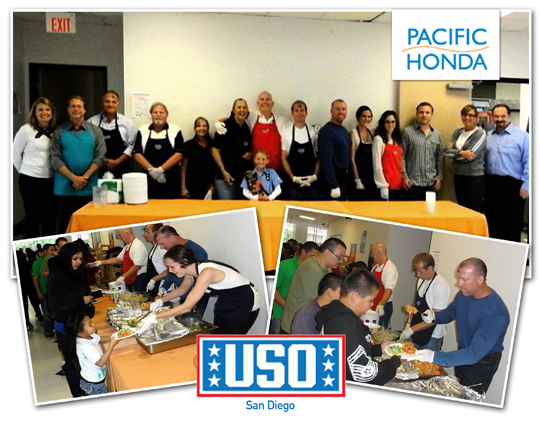 Sunroad Automotive kicked off this event on Tuesday, April 24th, at USO’s weekly Tuesday Night Dinner where its employees personally served the families in attendance and paid for the dinner. “We are proud to serve the families of our community’s heroes. They have embraced us whole heartedly with their big smiles and great gratitude when they’ve endured so much for our country. This is just our small way of extending our appreciation for their continued sacrifices.” said Wayne Meyer, president of Sunroad Automotive. Proceeds of the sale will also benefit USO’s weekly dinners, store, concerts and volunteer program. Active and retired military are encouraged to purchase a vehicle during this time to support these programs.